Bill Gleeson, owner of Main Street Automotive, was born and raised in Vancouver. His father worked as a pharmacist on Main Street during the 1950s, operating his own drugstore on 49th Avenue. Bill got his start in the automotive industry while in high school, pumping gas at a station on the corner of 49th Avenue and Fraser St. It was about the same time that he started his apprenticeship program. 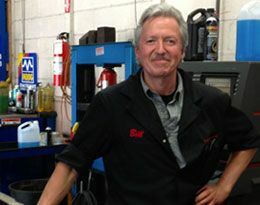 By the age of 22, Bill was a licensed mechanic technician and 10 years later he opened his own business, a Petro-Canada station at the corner of Broadway and MacDonald. It was during the year 2000 that Bill continued the family tradition by purchasing a property on Main Street and opening Main Street Automotive. Since that time, Main Street Automotive has endeavoured to provide the highest quality auto and truck repair services available in the area. The advantage in coming to Main Street Automotive, rather than a chain or franchise location, is simple: Accountability. We offer personalized service with no run-around. You will always deal with the same representative or technician during the entire process, eliminating delays and confusion. When you have a problem with your vehicle, come to the automotive repair shop that treats you like you’re somebody special – Main Street Automotive.